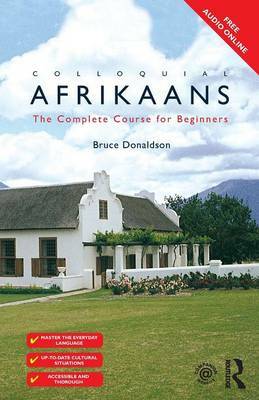 Colloquial Afrikaans provides a step-by-step course in Afrikaans as it is written and spoken in South Africa and Namibia today. Combining a user-friendly approach with a thorough treatment of the language, it equips learners with the essential skills needed to communicate confidently and effectively in Afrikaans in a broad range of situations. No prior knowledge of the language is required. Balanced, comprehensive and rewarding, Colloquial Afrikaans will be an indispensable resource both for independent learners and students taking courses in Afrikaans.